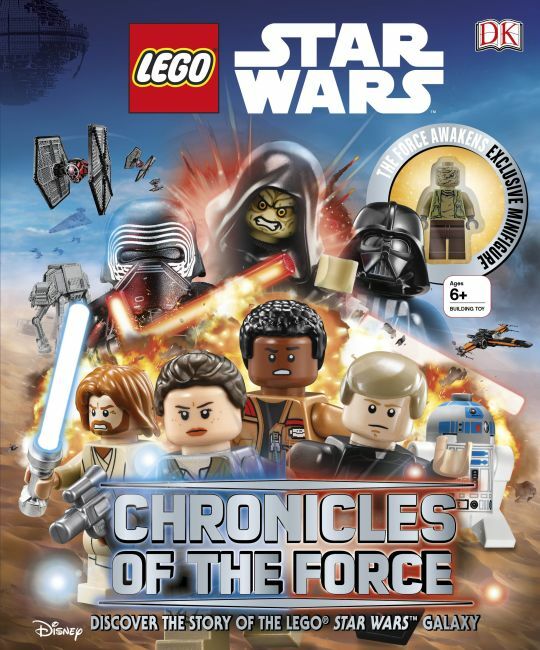 A must-have for fans of the live-action Star Wars™ saga and its LEGO incarnation alike, LEGO Star Wars: Chronicles of the Force is the most up-to-date companion to LEGO Star Wars, with detailed information about the latest characters and items including Jedi, Sith, Droids™ and vehicles. Full of action-packed imagery and quirky, fun facts this guide is perfect for LEGO and Star Wars fans of all ages. Do you know what are the top four Wookie weapons or how many bricks it takes to build a life-size LEGO X-wing? Discover the answers to these questions and more in LEGO Star Wars: Chronicles of the Force. Featuring an exclusive new LEGO Star Wars minifigure, LEGO Star Wars: Chronicles of the Force follows the same format as DK's LEGO Star Wars: The Dark Side and LEGO Star Wars: The Yoda Chronicles. LEGO, the LEGO logo, the Brick and Knob configurations and the Minifigure are trademarks of the LEGO Group. © 2016 The LEGO Group.